The everyday life can be stressful and create a lot of anxiety and pain. Even if you are on vacation it might be hard to let everything go and just enjoy the moment. Here at Serenity Massage & Spa we want to relieve those kind of feelings through our high quality treatments in a peaceful environment Our goal is to make every customer feel welcome and that they will leave with a feeling of peace and happiness. and a wish to come back again soon. Inside Serenity you will find soothing touches, tranquil settings, ambient sounds, intoxicating aromas and a team of fully trained staff which will all help you on a rejuvenating journey to restore and harmonise your mind, body and soul. 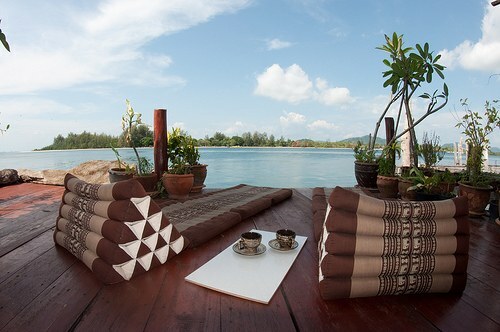 Serenity Massage & Spa is a spa built on wooden piles over the sea, right in the middle of Saladan Koh Lanta. Koh Lanta has only two main roads, one of the west coast connecting all the beaches and resorts and one on the east coast. If you stay along any of the popular beaches at the west coast you can just go to the main road and follow it to the left by motorbike or cab. You may just tell the driver to go to Serenity Massage & Spa or to Saladan Centre. When you arrive in Saladan keep going till the junction where you see the water and small beach inlet. Turn right here and Serenity is located 150 meters on the left.